The Twist Radio iPhone app is a newly launched app that offers something new to the music discovery scene. As a self-proclaimed fan of Last.fm, Twist Radio fits right into my love for music apps since it supports both Last.fm and SoundCloud. It works as an aggregator for music from these two services, which is sort of like a mashup of mainstream music that people are listening and sharing on Last.fm, and indie music that you can discover by browsing artists who upload tracks to SoundCloud. The service is neat because it gives you a taste of music you know you’ll love and lets you find new music that you might love based on your previous genre likes. Twist Radio kind of works like YouTube in that manner, since you find find mainstream and indie together. The only difference is it functions as a song aggregator instead of a video aggregator. Once you find a song you want to listen to using the iPhone app , you just tap it and it will add it to your personalized station for listening to it later. I really enjoyed the search function, because it was laid out well and easy to understand. Once I found music I liked, a quick tap had the music in my station for listening, which is the greatest feature Twist Radio has to offer. Twist is able to pull from these two services by taking advantage of their API’s, which make it easy for people to share their songs. You can add your favorite songs to a station with a quick search and scrobble them to Last.fm when you listen. You can also share these songs with others, which is a pretty neat function that you don’t see in many music discovery apps. The only downside to Twist Radio is that because most of the SoundCloud clips are user uploaded, it’s a real toss up as to what you’ll find on the service. Twist Radio is available for iPod Touch , iPhone, and iPad devices, so if you’re a real music fan who loves listening to great music and finding new music that’s not in the mainstream, definitely give Twist Radio a try. I’ve found some great artists through the SoundCloud integration and I’m finding more each time I listen to music using it. The only thing I wish the app allowed was better SoundCloud integration so if I like something enough from a certain artist, I can pay or donate to them for their music. Still, as a music discovery service, Twist Radio is a pretty great twist on an old application idea. 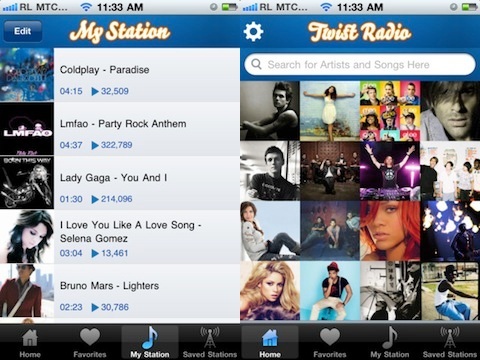 AppSafari review of Twist Radio was written by Darius Reimm on October 26th, 2011 and categorized under App Store, Free, Fun, Music. Page viewed 4309 times, 1 so far today. Need help on using these apps? Please read the Help Page.